You might be wondering what’s up with all the barn paintings. Last summer, I was feeling particularly sad and like I didn’t fit in here. My favourite part of driving all around with the girls doing all the typical summer stuff, was seeing barns. 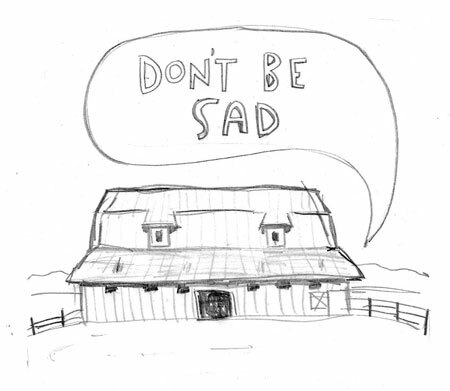 Not the beaches or lighthouses or quaint towns… but these sad and adorable barns. Somehow they make me feel better about living here. i think i know what you feel. For the past six years our family has been passionate about red covered bridges in Quebec. We started visiting the ones in Abitibi, where there are lots. Slowly we’re covering a bit more ground. It makes us feel … as if we belonged to this era, seeing old bridges. Odd, but comforting nonetheless. i love the paintings & the sketches of the barns. thanks kathleen, it’s nice to hear i’m not alone in this, you described it perfectly.